How do I check my Prepaid Visa RushCard available balance? You can check your balance by logging into your card account online, by using your mobile app (standard text message and data rates, fees, and charges may apply), by calling 866-RUSHCARD (866-787-4227) or at the ATM. If you enable RushTEXT in your online card account settings, you can text "BAL" to MYRUSH (697874) (standard text message and data rates, fees, and charges may apply). If you check your balance at the ATM, fees may apply. Please see the Cardholder Agreement for details. You can check your transactions by logging into your card account online or by using your mobile app (standard text message and data rates, fees, and charges may apply). You can call 866-RUSHCARD (866-787-4227) to hear your last 10 transactions. If you enable RushTEXT in your online card account settings, you can text "HIST" to MYRUSH (697874) to see your last five (5) transactions (standard text message and data rates, fees, and charges may apply). 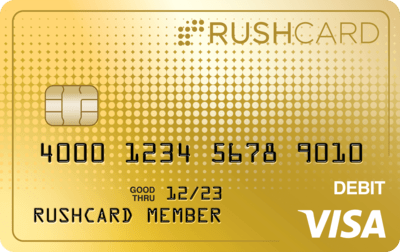 The RushCard Prepaid Visa® is issued by MetaBank®, Member FDIC, pursuant to a license from Visa U.S.A. Inc. Card accepted everywhere Visa debit cards are accepted. RushCard, UniRush, Pay Your Own Way, Rush Unlimited, RushCard Live, and RushGoals are registered trademarks of UniRush, LLC. Rise to Thrive, 24k RushCard, Carbon RushCard, Edge RushCard, Gloss RushCard, Midnight RushCard, Sequin KLS RushCard, and Suede KLS RushCard are trademarks of UniRush, LLC. All other trademarks, service marks and other registered marks are the property of their respective owners. © 2019 UniRush, LLC. All Rights Reserved.